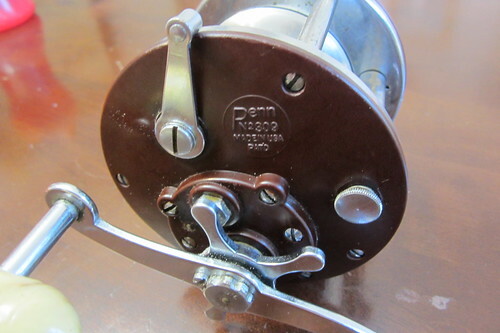 It is hard to find a more reliable reel than a penn reel. They are rugged, dependable, easy to maintain, and inexpensive. I recently purchase a used Penn 309 level wind off eBay. I think I paid less than $30 for it. The 309 is a workhorse that is capable of catching any freshwater fish in North America and most of the saltwater fishes. From monster catfish to medium shark, it is a great reel! I have read that some fisherman can cast it quite well. I am inexperienced with bait casters and cannot cast it at all. I get giant bird nests each time. To help with this I decided to mag it. Magging (sp?) 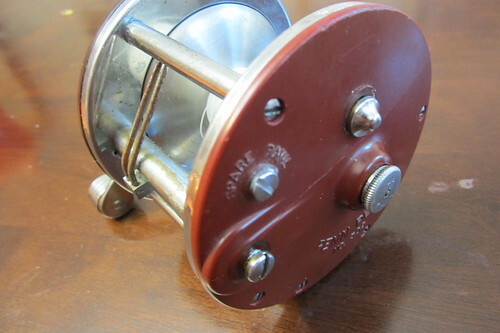 a bait caster simply means adding powerful magnets to its frame to help slow down the spool. It does not work the way you are thinking. The magnets do not slow down the spool by pulling the spool with their magnetic fields. In fact, for this to work the spool needs to be non-magnetic and the magnets should not touch the spool. An aluminum spool is perfect. What happens is the magnets create an eddy current brake. It is complex, but basically (to the best of my understanding) when the spinning spool comes in contact with the magnetic field a small electrical charge is produced. Electricity and magnetism are quite similar. 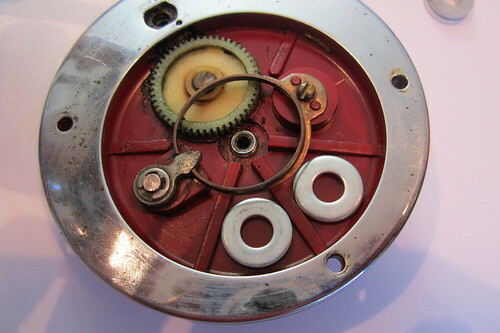 The electrical charge on the spool pushes against the magnetic charge, creating a brake. 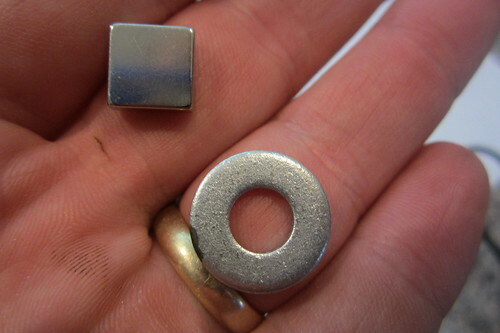 A stack of rare earth magnets that are slightly smaller than the washers and as thin as possible. Rare earth magnets are sold at some hardware stores and can be found easily online. They are shinny and very, very strong. Don't let small children play with them. Before I begin it should be noted that you can screw up your reel if something goes wrong. I'm also sure this voids any warrantee that came with the reel. Don't blame me if you ruin your reel. 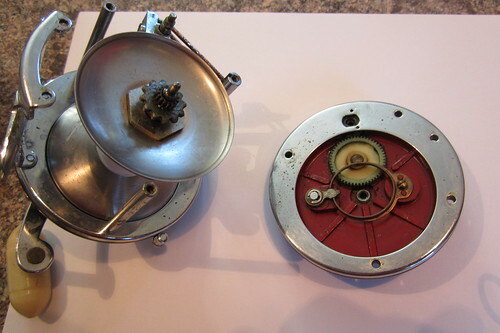 The first step is to remove the plate covering the side of the reel. You have to remove five small screws to do this. You will notice that there is a surprising amount of space inside the cover plate. Position your two washers inside this plate. Right now you are just test fitting them. They need to sit in without touching any of the other parts. Once you confirm that they fit, epoxy them in. Be very careful. 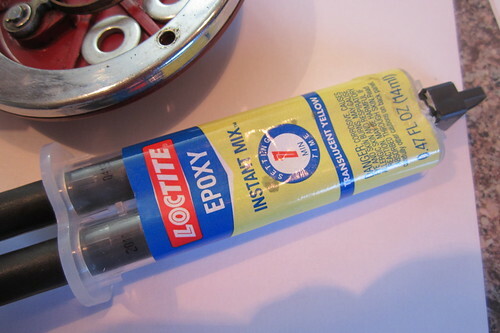 If you get epoxy on the working parts of the reel, it is ruined. After the epoxy has fully dried, add a magnet to each washer. They will stick in place by magnetism. I like to place them so that they are pushing against each other. At this point you are basically done. 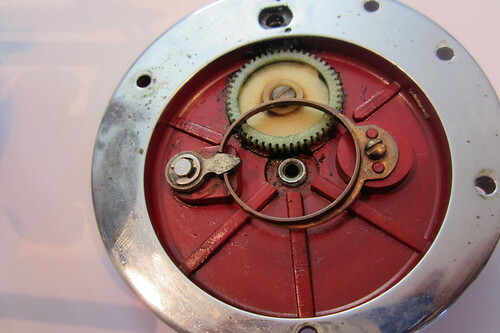 Reassemble the reel and check to see if you like the brake. 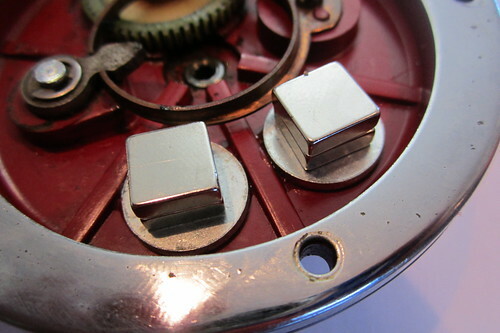 If it is not strong enough, take it apart and add a second set of magnets. Resembling the reel can be tricky, but after the first time you do it is it a snap. The closer the magnets are to the spool, the harder the brake will be. 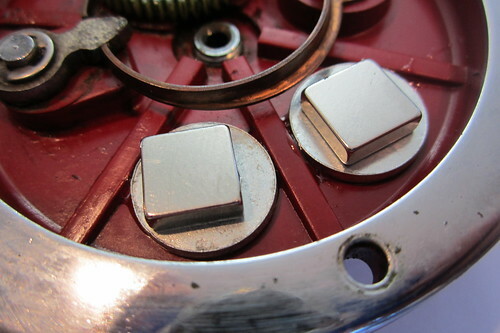 You may need to add washers to shim the magnets closer until you get the desired brake. Just make sure the magnets do not actually touch the spool. There you have it! The Penn 309 is still not easy to cast, but it is doable!